It can be fun to get into shape over the summer. Some say it’s easier because the weather seems to coax everyone outdoors and into fun activities. 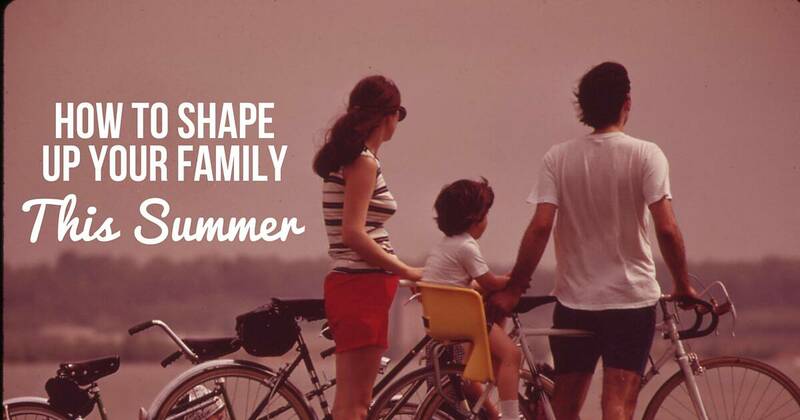 If you want to shape up your family this summer, here are some ideas. With physical activities and healthy food, cookouts are a great way to encourage your family’s healthy lifestyle. Picnics are similar in that they encourage everyone to get out and move. You can plan activities or just let everyone run around outside. Hold a family football tournament or some other competitive activity. You can do a cook-out in your backyard or at a local park with proper facilities. Make it a regular event to reap the healthy benefits. And make sure you’re cooking healthy food – this is important to the fitness aspect of the cook-out. Gardening involves exercise, especially if you shun automatic luxuries such as gas-powered tillers, weed whackers, and other motorized amenities. Children tend to like gardening, too. Try giving them a special plot or area of the garden to tend. Gardens require maintenance, so weekly or bi-weekly “family days” in the garden are not only healthy, they are also necessary for the garden to thrive. The healthy foods that result from your efforts will enhance your family’s fitness journey. A little research will reveal what your community is up to this summer. Maybe a clean-up day is being held, or a summer activity camp, or some other event that promotes wellness and exercise. There may be fundraising walks, marathons, or tours around your town. Sign the family up for these local events this summer. Family members usually appreciate being asked for input. Have a family meeting and discuss what activities everyone likes. Perhaps your spouse likes biking, your youngest child enjoys swimming, and your oldest likes baseball. Schedule these activities into your family’s routine so that equal time is dedicated to something that everyone wants to do. Even if it’s as simple as a game of tag, the entire family will be actively engaging in each others’ interests. It’s summer! Produce abounds, from peaches to tomatoes to grapes. Don’t hesitate to incorporate these healthful, seasonal foods into your family’s diet. Summer is a great time for grilled vegetables, frosty fruit smoothies, and big salads. Try to keep your family’s summer fitness program a positive endeavor. Telling the family something like “we’re all too fat” is not necessarily the best way to garner enthusiasm about participating. Rather than focusing on body image, talk up the fun of the activities, the deliciousness of healthy summer foods, and how good it feels for the whole family to be outside together.